Log in the system page, enter the agent interface. Find the campaign pannel(Queue ) below the campaign corresponding to the queue number, and the two options, login, pause. After elected “login”, then the current agent has been logged into the queue which belongs to the queue number, the queue was according to the state of all the agent be logged to assign the calls. After elected “pause”, then the agent has been logged are not be assigned phone calls whether he is busy or free. When elected logoff, the current agent were logged off from the queue, the queue will not assign any phone calls to the agent. Return to the management interface, enter the dial list below campaign find the queue number corresponding to the campaign name, click on the campaign “edit” to open. Find queue number, indicate the agent to be logged in the queue number; Queue Context, the crew used the queue context, freePBX use the latest version is the current from-queue; Use Extension Channel For Queue, where there are two cases. One case is logged in default, do not be checked before “Use Extension Channel For Queue”, in the asterisk CLI to perform queue show. Another case is to use” Use Extension Channel For Queue”, checked before “Use Extension Channel For Queue”, in the asterisk CLI to perform queue show. 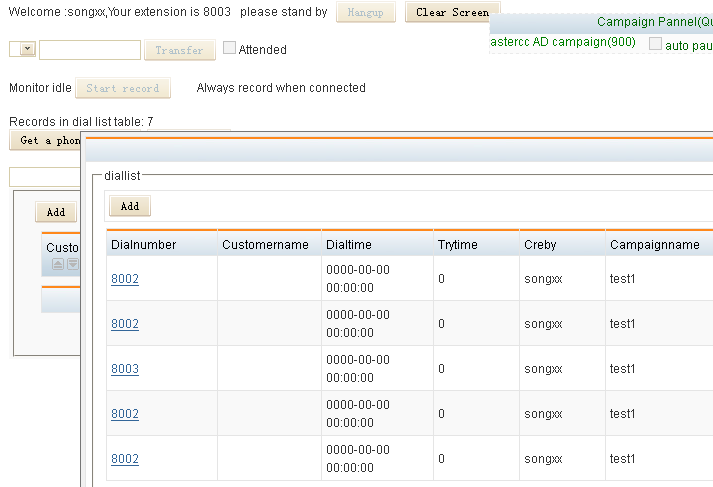 Channel option, sip/8003, 8003 is the current agent extension. Log in system and enter the agent interface, if the dial list of agent interface have no data, the “start work” function is forbidden. Dial list exists phone number, the “start work” can be used properly. The phone number in dial list can be added manually or through batch import entry. Make the dialnumber in dial list, agent can click on “start work” to call outbound. Click the “Start work”, the system will be calling dialnumber in the dial list one by one, at the moment the window about information will pop up, such as “input customer information”, “add records” pop-up window. When the call is connected, the agent can communicate with customers to get the information input, the upper left corner points out the system is recording. After the call, click on the “hang up”, then the system will turn into count down and dialing the next dialnumber automatically. Find “dial interval”, setting“0”, the system default countdown in 30 seconds, setting greater than “0”, according to the number as the seconds of countdown. There are two or more than two dialnumbers in dial list will turn up count down, only one dialnumber can not be. Agent can also stop work at any times as condition change, then the system will no longer auto-dial the dialnumber from dial list in agent interface. Into the system management interface, find the import function，enter. Choose file to upload, you can browse the files you want, or you can choose an existing file, then upload it. After successful upload, the data you want will upload to the system, then you can select the form, specify the data into the appropriate form. Select customer, there will be corresponding to the fields of this form. According to the data appear in front of several pieces of information, each vertical line corresponding to one information, information corresponding to the field appears to the left and the fields of the code will fill in the information at the bottom of the box. Next, you must tick before “add” , and the data adding to the dial list at the same time, select the number corresponding to the phone, select the outbound time, if you want to be evenly distributed to agent, then you do not tick before “assign”, if you want a agent assigned to a designated, tick in front of the “assign”, and noted the number of the agent, if you want to assign two or three agent you can with “,” separated. Choose your campaign, and click Import. Before importing, when you make the phone number that will be imported to assign to a designated agent, then after importing is completely, return to the agent interface, you will find all the phone numbers waiting to be dialed in the dial list. If you do not want to assign these phone number to a designated agent, you do not have to tick before “assign”, return to the agent interface, you will find there is not any date in the dial list from agent interface. then all date have been imported will be found in dial list, the system do not assign to any agent. Then you go back to “customer” page, you will find all the data has been imported successful in your customer data sheets, and all information corresponding to each field in form. At the same time, dial list also appear to all the same data has been imported, according to the dialing time to go to dial the number. Open login screen, enter the correct user name and password to submit into the management interface. Choose “dial list”， create a new campaign, click to campaign and then select the “Add” button. Pop-up a list box about add campaign, according to your demands to fill the information completely. Under the toolbar you will find Campaign Result, add. Then it will pop up a window of Campaign Result You can set up by yourself according to your own business maybe used in result name, it can be refused access, voicemail, dead number or other such results. The campaign name you can choose the campaign that you have established just now, or you may also specify the choice plan. Back to agent began to call the number from dial list, add a phone number Arrow points to add a phone number to dial list, fill in the information completely, continue. You can also choose to bulk import, in order to import the phone number into dial list. When the call is connecting, the screen will pop up a window for agent to record the customer information. According to call ends the agent may choose the call result setting up before corresponding to the state. Then click Update. System prompted to update successfully. 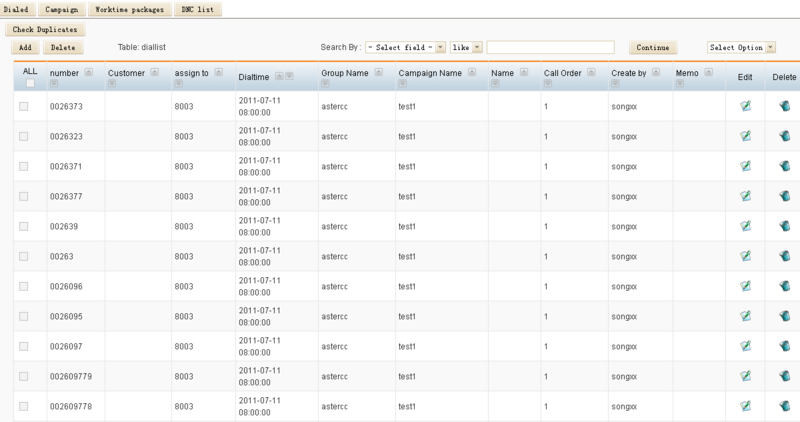 Right now you go back to see the dialed, you will find the results of a column in the Campaign Result information displayed. Allow you clearly to see the result of customer in the form of campaign result. Then let we see the dailed, the system will prompted the call is answered or no answer, which results in the campaign result will be prompted to the form or how about answer and no answer. Management will consider screening out potential customers in its next outbound, object among those empty number, wrong number or do not want to keep the number of filtered out. 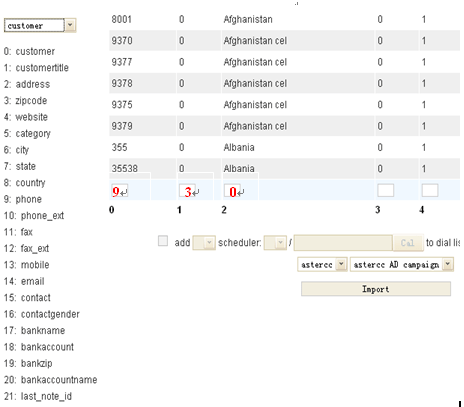 First, we find the search option to open the drop-down list, find the campaign result, input you want to keep in the back of the results, for example, you want to keep “refuse”or “voicemail,” enter the appropriate results, and select Options – “recycle”, so that these dailed numbers will be present to dail list again. The numbers be recycled will present to dial list once again. With this method, you may also filter out the wrong number or dead number to delete. In this way, the dail list will save those numbers that you have already recycled unsuccessful once more, to make the next dial-up, to keep more potential customers.